I hear Thalia padding down the hall, having returned from her trick or treating. Thalia’s mother took her around the neighborhood, plus Augustus’s tobacco shop and Melissa’s bookstore. Maternal suggestions of dressing up as a witch or a ghost went unheeded. Thalia chose to disguise herself as a phone booth, which involved a cardboard box, poster paint, and a small brass bell. In these days of cellphones, where she got that bit of antique knowledge I have no idea. Grimm fails me on Halloween. There are stories in the collection with witches, but they don’t quite evoke the spirit of this unhallowed day. The old English fairy tales do better. Thalia is in her jammies and crawls onto my lap with Teddy in hand; I reach for English Fairy Tales, by my friend Joseph Jacobs, and turn to Childe Rowland. ‘widdershins’ around the church, has fallen into the hands of the King of Elfland, and now resides in the Dark Tower. 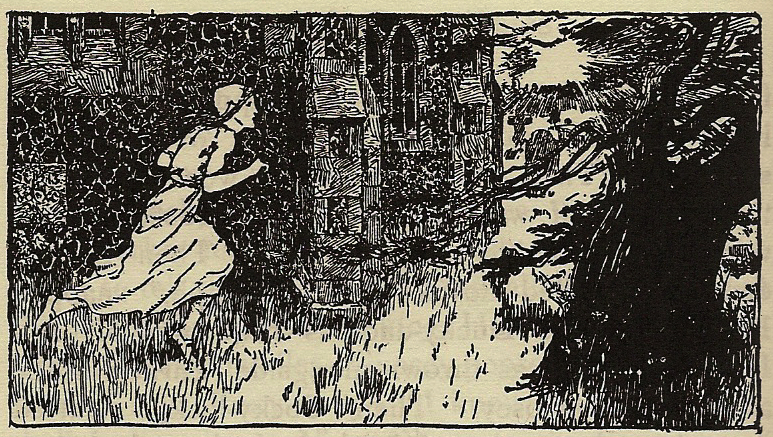 One by one the elder brothers go off in search of their sister until only the youngest, Childe Rowland, is left. The queen is reluctant to let him go, but finally concedes and gives him his father’s sword with an enchantment upon it. The warlock instructs him not to eat or drink while in Elfland, and to cut off the head of anyone to whom he speaks until he gets to the Dark Tower. After some travel and a few heads, including one of a henwife, (“Aww,” says Thalia.) Childe Rowland comes to the Dark Tower, which is actually a tall, terraced, green hill. He gains entrance following the instructions of the henwife by riding widdershins around the green hill three times calling out “Open door! Open door! Let me come in.” On the third pass, a door appears in the side of the hill. He walks down a long narrow passage, which leads to a large chamber, rather cathedral-like in appearance, lit by the curious device of a large, translucent, hollow pearl, inside of which spins a blue gem emitting a bright glow. There he finds his sister, Burd Ellen. She grieves at his coming, declaring her husband, the Elf King, will overthrow him as he did their two brothers. Childe Rowland, suddenly hungry, asks for food and drink. Burd Ellen, under a spell and unable to warn him, brings him bowls of bread and milk. Before he can eat anything, he recalls the warlock’s words, throws the bowls to the floor, and calls for the Elf King to face him. 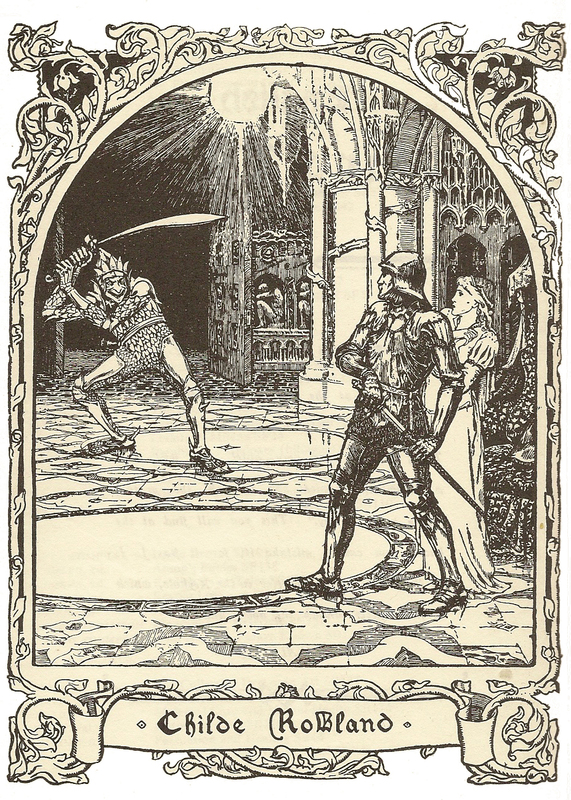 Through the same door that Childe Rowland entered, a tall, armored elf appears and they do battle, Rowland eventually defeating him. The king calls for mercy and Rowland grants it if Burd Ellen is freed, their brothers restored, and all allowed to leave Elfland. The Elf King takes a vial of red liquid and moves off to a small room adjoining the main chamber. There on stone tables lay the brothers’ bodies. The elf touches their ears, eyes, nose, mouth, and fingertips with the liquid, restoring them. He pronounces a spell over Burd Ellen and she is released. The happy siblings return home and Burd Ellen never passes widdershins around the church again. It is a delight to hear the bell over Augustus’s door. I haven’t been in his shop since doing in my foot, and I smoked the last bit of tobacco finings last night. His suggestion is as much an excuse to sit and talk as it is a courtesy, and I am glad to oblige. We settle into our comfy chairs. “Well, let me summarize. Apparently Jacobs was taken with this tale. His notes are a bit longer than the tale itself. He goes on for seven or eight pages, with illustrations. No other tale gets as much attention, a page or two, often a mere paragraph. Augustus nods in assent. The smoke of Raven Black floats between us. 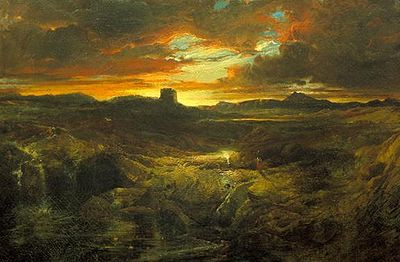 “Jacobs talks about that too, as analogous to the German ‘wider Schein,’ against the appearance of the sun, or counterclockwise. Perhaps it means in the opposite direction or against sense. I sit on the trunk of a fallen tree that lies across the path through the Magic Forest. This is as far as my recovering ankle will allow me to traverse uneven ground, yet it is far enough to see the sun setting behind the Glass Mountain. I won’t stay long. I can feel the temperature dropping. I let my thoughts flutter through Childe Rowland and they settle on the hero walking through the underground passageway. I have a preference for tales that let me follow the heroes and heroines beneath the earth’s surface. As I sit on my log I mentally list some of those favorites. Katie Crackernut. In this tale a fairy mound appears similar to Childe Rowland’s green hill. Worn Out Dancing Shoes. A hidden staircase in the princess’s bedroom leads to an enchanted underworld. Sprig of Rosemary. Our heroine pulls up a rosemary bush, unearthing a stairway to a subterranean castle. Old Rinkrank. I am sitting here looking at the Glass Mountain, which swallowed up the princess who became Old Mother Masrot. The Three Feathers. The simpleton brother moves aside a stone to reveal another descending staircase, this one to a colony of toads. The Three Snake Leaves. We find our hero confined to a tomb with his dead wife. I can list more examples as easily as Alice fell down the rabbit hole, but what are their meanings? In my mind’s eye I see Freud sit down beside me on my log, with Bettelheim standing behind him. In my understanding of Freud, he might argue that the hero or heroine descends into the realm of the unconscious. But if I follow my hero or heroine to that realm, I’d expect Rowland, Katie, and the simpleton to face their fears, uncertainties, and frustrations; reaching into the dark corners with trepidation. Instead, I see my protagonists encounter wonderment, gain knowledge, and win the prize. Jung sits down on the other side of me. I anticipate his argument that the hero or heroine enters the realm of the collective unconscious, an entirely difference place from Freud’s unconscious. Here can be found the accumulated visions of our human race. I use the word “visions,” thinking it the right term to describe what the collective unconscious contains. In Childe Rowland we see the long, dim passageway. In Katie Crackernut we see the baby fairy waddling around, playing with magical devices. In The Worn Out Dancing Shoes we see the forest of silver, gold, and diamond trees. In The Sprig of Rosemary we see the snake skin in the forbidden box. I need not go on. The collective unconscious does not speak to me in words. I perceive that words make up language, but are themselves not things. They are symbols. The visions of the collective unconscious are also symbols and make up another language, one we cannot hear. I am not sure—although I call them visions—that we can really see them, but rather feel them. I blink and my log companions are gone. Gone with them is my confidence that my line of thought has any substance. I sigh, shiver, and start for home.